Santa Maria, Lompoc, Solvang and Nipomo. Special editions of the Santa Maria Times, Lompoc Record and Santa Ynez Valley News will be for sale for $1. 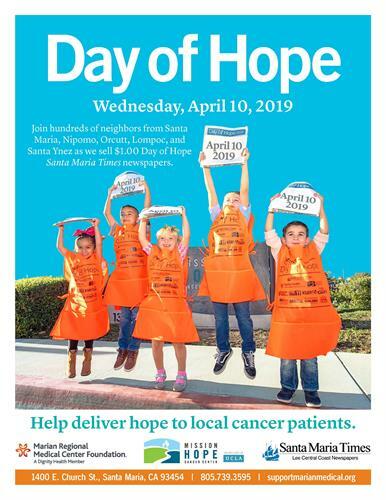 Hundreds of volunteers will take to the streets of Santa Maria, Lompoc, Solvang and Nipomo on Wednesday, April 10, 2019 during the sixth annual Day of Hope, a fundraiser benefiting Mission Hope Cancer Center. On this day there is a chance for each of us to buy the Santa Maria Times, Lompoc Record, or Santa Ynez Valley News, from local volunteers for $1, with all proceeds benefiting programs that support local cancer patients and their families.